Predict Barbados weather - any day, any time, any location! I've lived in Bim for 20 years and have never seen anything this accurate! Was going to book in the Gap for a week - used your online tool and it told me I should wait. It was right! Dead-on accurate. It told me to stay off the links for a day when the local forecasts predicted sun. Sure enough, it rained all day. Uncannily correct! I can choose a beach and be certain whether I'm going to have sun or not. Invaluable! An important tool for planning outdoor meetings and events. I can be travlin' anywhere in de world and check de weather pun de Rock to see if I need an umbrella -ella -ella. You've planned your holiday for months. You've invested a lot of money in this trip and the last thing you want is to have it ruined by weather. Sure, you can get a weather forecast from great sites like Weather.com, AccuWeather, Weather Underground, and more. But do you believe them? Can you really depend on them? Or should you listen to the advice of anonymous 'experts' on sites like TripAdvisor? Maybe they've been to Barbados on a visit once or twice. Maybe they actually live there. But does that make them weather experts? Do you really want to risk your hard-earned travel dollars on anonymous advice? Say you're from the UK and, let's face it, likely haven't seen the sun since you were 12. You just want to be able to step outside into dry, warm air and enjoy some sunshine. Before, it was always a gamble. You booked your trip and hoped for the best. You know it rains in the tropics. After all, that's how they get all that lush, green scenery. You just don't want it to rain during your trip, right? Well, what if you could know what the weather will be like in Barbados on any date, with over 98.6% accuracy? Well, now you can. BimWeather.com is proud to announce the Weather Encabulator (WENCAB), the only Barbados weather tool you'll ever need. You simply enter your holiday dates online and WENCAB delivers a weather forecast that is the most accurate available, no matter how many days, weeks or months away your trip is. Why should I believe your forecast? Because the Weather Encabulator was developed by the Barbados Aggregation of Meteorologists (BAM). WENCAB utilizes their new and exciting technology to deliver a weather forecast that is literally best-in-class. This patented method produces results simply not possible with older forecasting technologies. We're excited to partner with BAM by providing an online interface to WENCAB, bringing you the ability to predict Barbados weather not only on specific date, but also at a specific time and location! That's right. Even down to a specific location on the island. 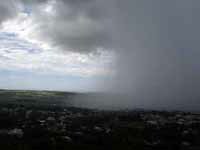 Barbados is well known for having different weather in some parts of the island, and at different times. It might be raining in Holetown and yet sunny in Oistins at 9:00am. Just check the WENCAB site before you head to the beach and you'll know which one is bathed in beautiful Barbados sun! How can you guarantee the weather? Well, we can't reserve sun on a specific day for you, but we can tell you what the weather will be like with an unparalleled level of accuracy. You can use this information to plan your holiday travels or activities on the island. For example, should you go to Bathsheba or to Paynes Bay? Should you leave the top down on the car? What about that golf game with the 9:00am tee time? Should you take a catamaran cruise or stay indoors at Harrison's Cave? It couldn't be more simple. Just go to the Predict the Weather page and follow the instructions. Currently, WENCAB can predict the weather down to a parish level of granularity. Version 2.0 will be able to increase that to street-level accuracy. Also, we will be producing a mobile WENCAB app for both Android and iOS smartphones so you can call up a forecast no matter where you are.